About 30 years ago, when I was (fairly) newly married, my husband and I bought a set of Farberware stainless steel pots. The original set we bought had 12 pieces -- 1-quart, 2-quart, and 3-quart sauce pans with lids, 4-quart and 8-quart pots with lids, and 2 skillets that could be fitted with lids from the other pans. 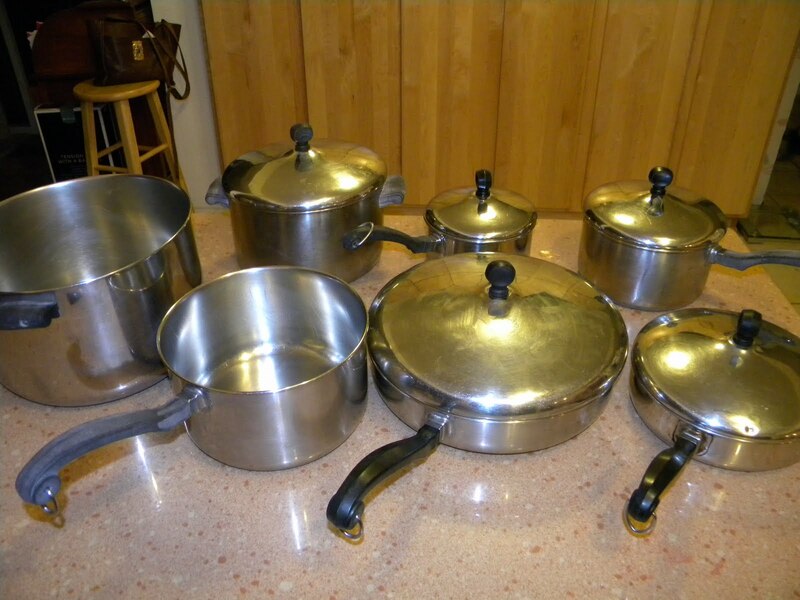 That is a picture of those very same Farberware pots and pans 30 years later. Okay, there are a couple of changes. We had to replace one of the skillet handles about 15 years ago when it became really loose for some reason. (Perhaps my sons had been banging it a little too vigorously?) 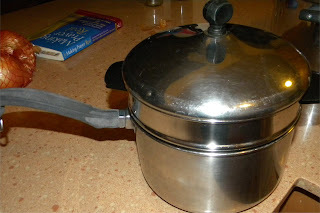 And the smallest (1-quart) saucepan was replaced because of a kashruth error (non-kosher food heated up in it by someone who was not clued in to the ins and outs of keeping kosher). There was nothing wrong with the pan otherwise; we put it in a Goodwill collection box and it's probably still in use today. And, over time, we also added bigger and bigger pots. In addition to a much larger skillet, we have 12-quart and 16-quart stock pots. All three of these pans use the same size lid, so one was put away where I couldn't readily reach it. There are two things about our Farberware that I wanted to talk about. First of all, I really, really like these pots and pans. My family has used them on a daily basis for over 30 years. Not every pan every day, naturally, but at least some part of the set is used each day we are at home. They have been used for cooking and head-wear (somewhere I have pictures), for banging on by children who wanted to make noise, and on occasion for storage. The second thing I wanted to share about the Farberware is my mother's reaction when she first saw it. She thought the pots looked really nice and asked how much we had paid for them. I told her that they cost about $100. This was in the late 1970s and was, I suppose, a considerable sum but my husband and I were both working full time and had no children so we could easily afford them. My mother quite literally threw a fit. I'll never forget what she said: "I've never paid more than $15 for a set of pans in my life!" Well, that's probably true, given the pans my mother used to buy. On the other hand, she replaced her pots and pans every couple of years because they would get beat up, or burned, or in some other manner became unusable. Over the 50+ years of her marriage, I'll be generous and say that she spent $15 every 3 years for new pans. That's about 17 times 15, or $255. 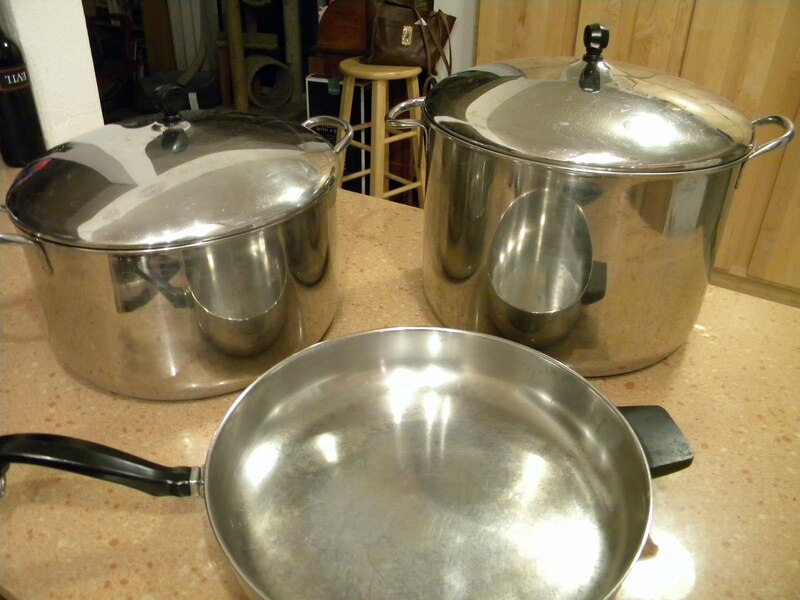 With the extra pieces we have bought, and the replacements we have had to make over the past 30 years, it's possible that we have also spent in the neighborhood of $255 for our Farberware pots and pans. On the other hand, our pots and pans are still in great condition and are still being used, as I said before, on a daily basis. The lesson we learned from our Farberware pots and pans was that you really do get what you pay for. Next week: For summer -- Strawberry Soup. This was supposed to be last weekend's post, but ... well, sometimes things happen. This weekend's post should happen on time. My children and I once decided that everything in the world tasted even better with the addition of one or the other of two foods -- chocolate or onions. Though we have tried, we haven't yet come up with something that would be improved by the addition of both. 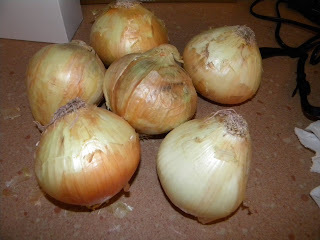 This method of preparing onions is a good one for people who really don't like the taste of onions, or who have problems with digesting uncooked onions. It's really simple, though time-consuming, and the taste of onions cooked this way is hard to beat. You might even be able to add chocolate to them. 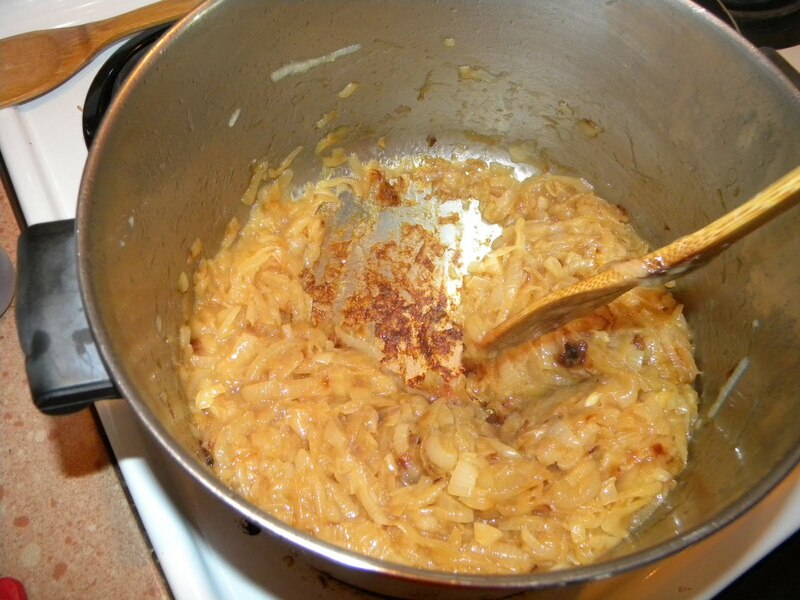 Onions are caramelized by cooking them for a long time over low heat. The process releases the sugars inherent in the onions and gives them a sweet oniony flavor. (No, that's not an oxymoron.) The cooked onions can be used in many different ways. 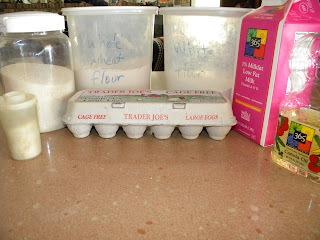 I like to make a big batch and freeze them in smaller quantities for later use. I usually start with about 5 pounds of onions. Big onions are good because that means you have to peel and chop fewer onions. Vidalia onions work well because they tend to be sweet anyway, but almost any white or yellow onion can be used. 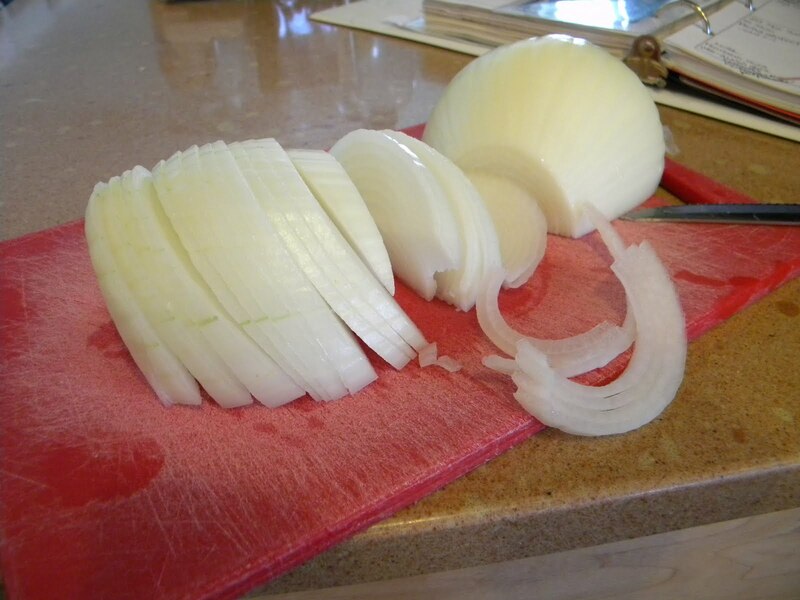 I slice the onions by cutting them in half, then slicing each half to form half-circles of onion. You can chop them up finer or even make rings. It doesn't much matter in the end. For 5 pounds of onions, I use one stick of butter. I melt it in a big pot and add the onions. That's a 8-quart pot and, as you can see, it is almost full of the raw onions. 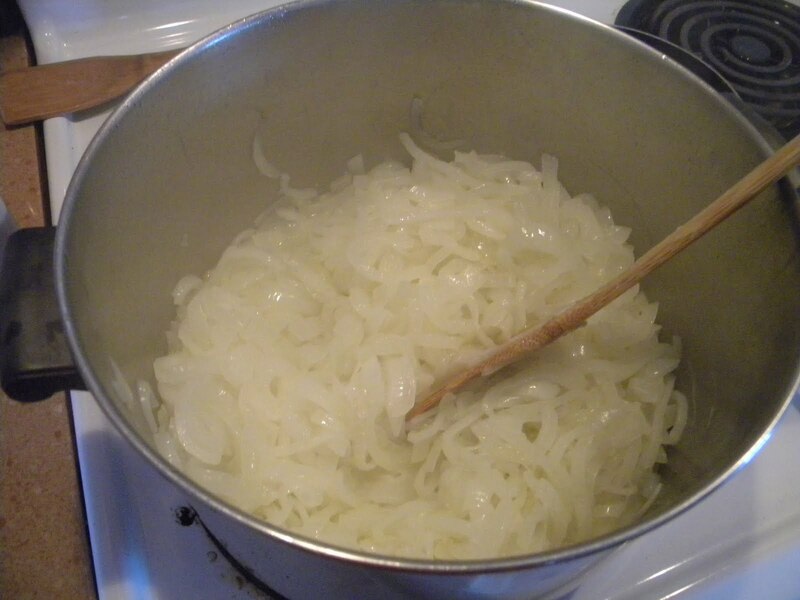 During the first 10 to 15 minutes, I stir the onions fairly frequently to make sure that the onions are coated with the butter. After that, I just check on them from time to time. The only real trick to this process is to use a fairly low heat under the onions. 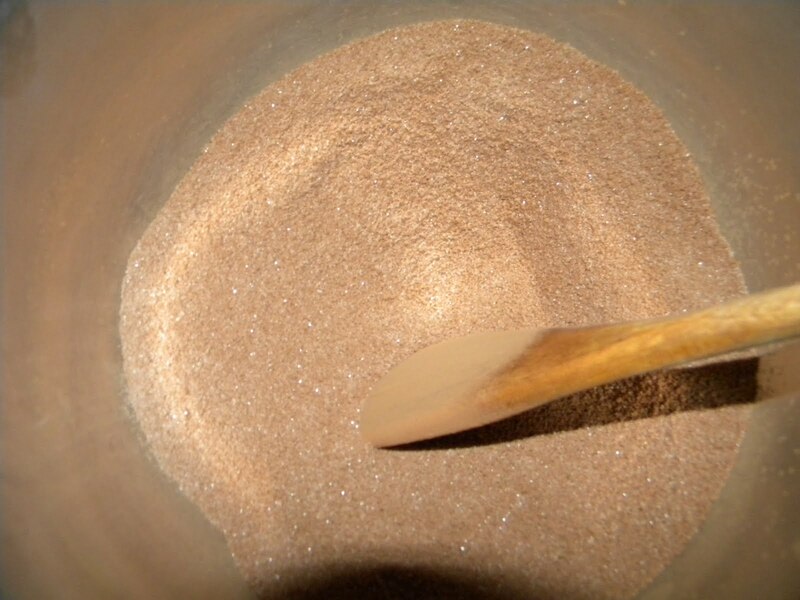 You can make them brown a little faster by adding a small amount of sugar (a teaspoon or two), but it's not really necessary. Eventually -- after a couple of hours -- the onions will start to brown and stick to the bottom of the pan. Notice how much the onions have cooked down. Scrape up all the stuff at the bottom and stir it into the onions. 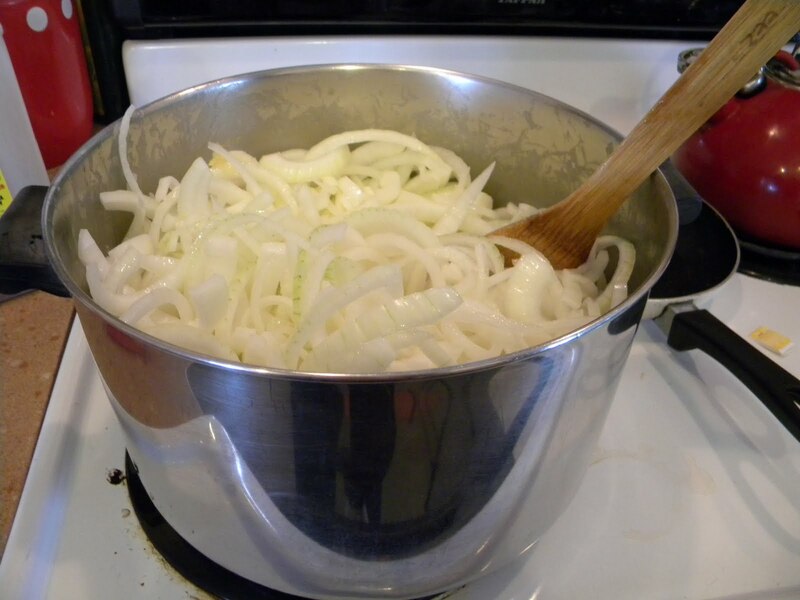 I often add a little water to the onions if they are sticking too much. At this point, I check the onions more often to make sure that they don't go from browning to burning. When the onions are browned to your satisfaction, they are done. At this point, they can be used to any number of things. We use them on pizza and in dishes where we want a sweet onion flavor. 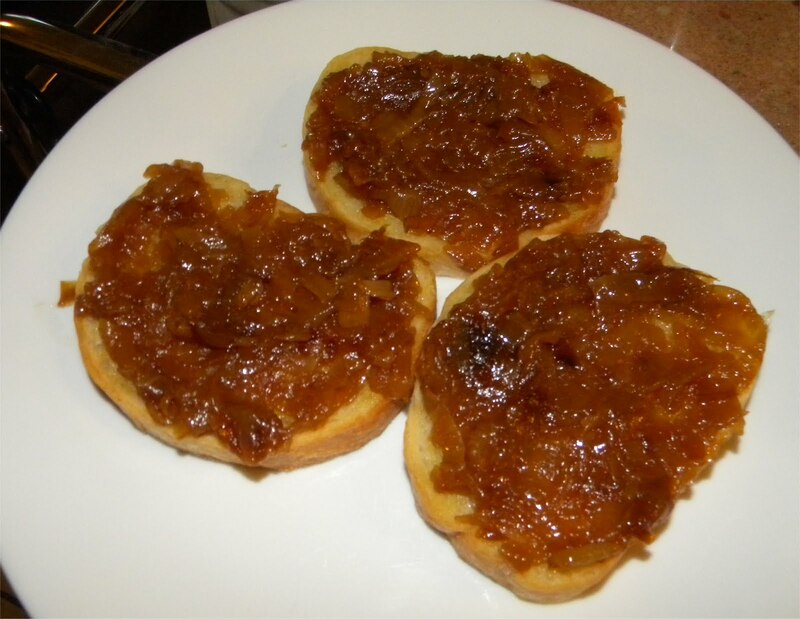 But one of the easiest and tastiest uses is to spread the onions on Italian bread that has been brushed with olive oil and toasted. It's impossible to describe how incredibly delicious this onion spread is. Try it yourself! I had it in mind to post a somewhat complicated cookie recipe this week, but then I decided that I needed a break after the blintzes last week. So this week's something sweet is a no-bake cookie recipe -- Oatmeal Fudge Cookies. 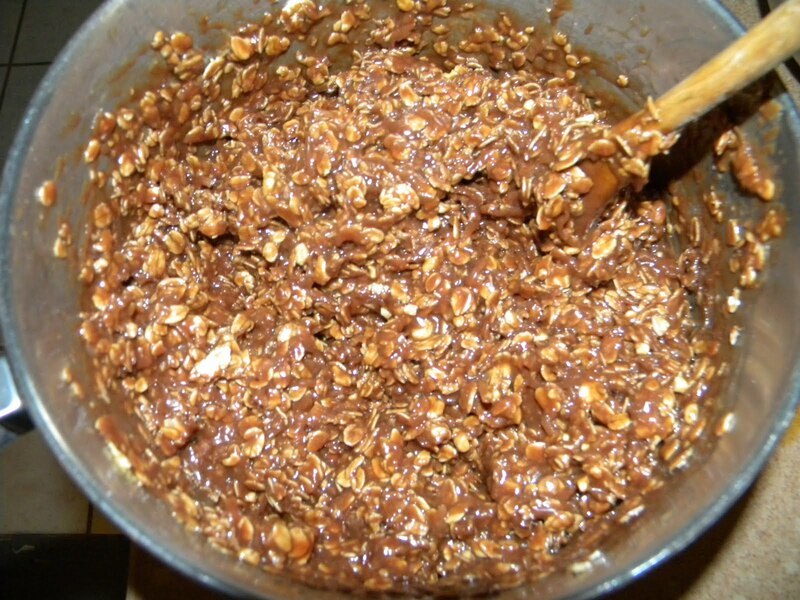 They are pretty much what they sound like -- a kind of fudge with oatmeal in it. Plus other good things. The basic formula is simple -- make a fudge-type sauce, then add oatmeal and other ingredients. 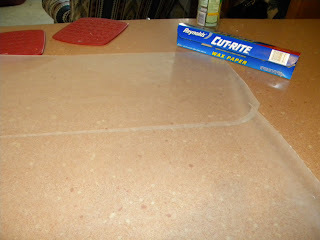 To finish the cookies, drop them on waxed paper. 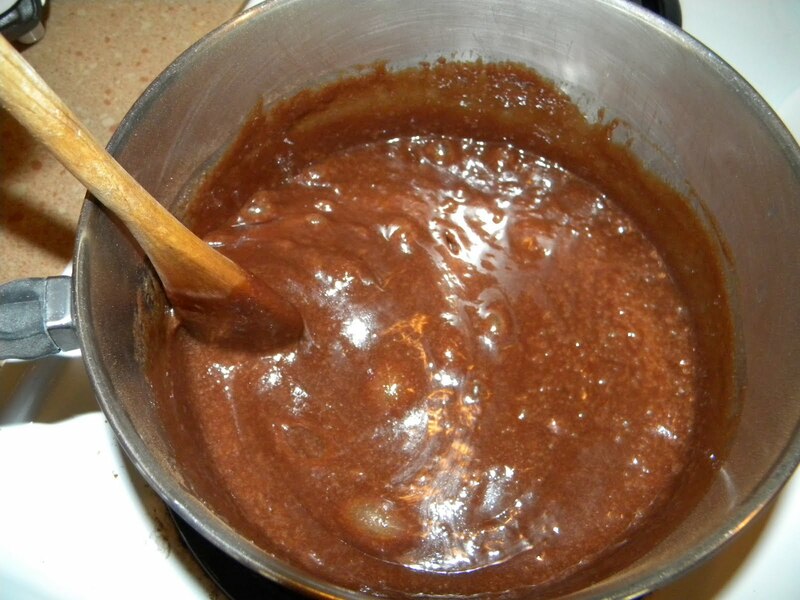 Fudge is pretty basic -- sugar, canned milk, butter, and flavoring (in this case, cocoa).This isn't exactly classic fudge, though the beginning is similar. First, however, it's a good idea to combine the sugar and cocoa. 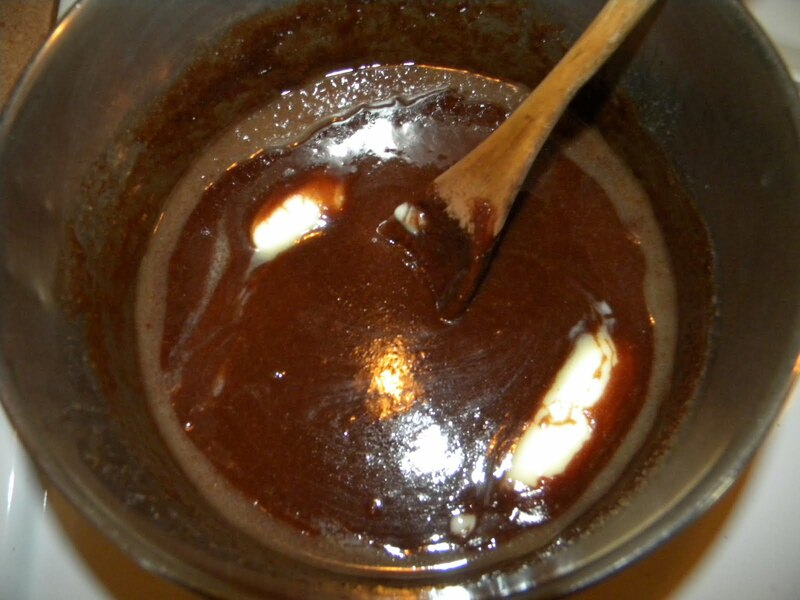 Combine butter, canned milk, and sugar in a pan and heat to a boil. In the interests of speeding things up, I set the fudge ingredients on the stove over low heat and then start getting everything else together. 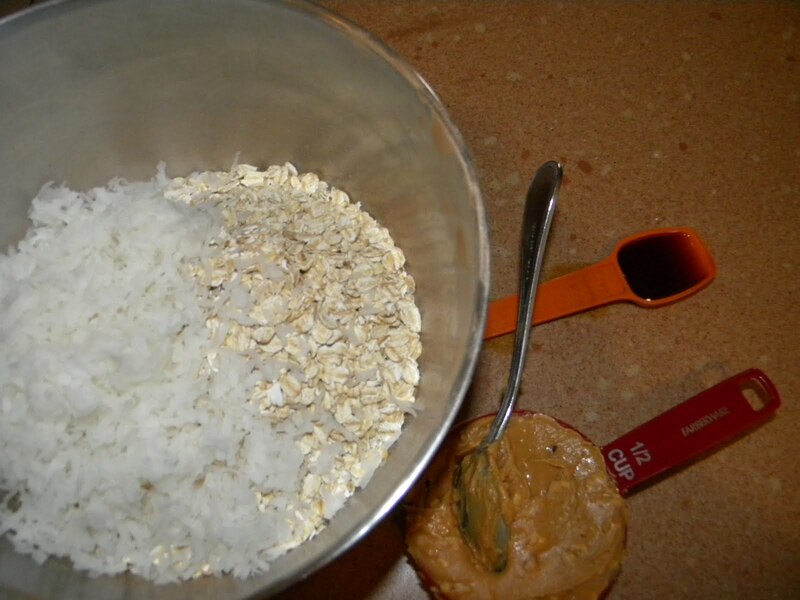 The rest of the ingredients for this cookie are oatmeal, coconut, and peanut butter. And a little vanilla. 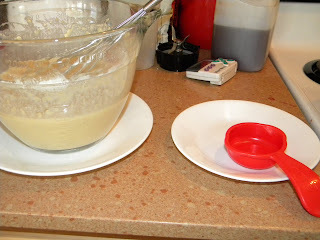 I also set up the work area for making the cookies before going back to the fudge mixture. In this case, it's just a couple of sheets of waxed paper placed directly on the counter. I do all this first because, once the fudge is cooked, time is of the essence. After everything is set up, it's time to go check on the fudge mixture. I turn up the heat at this point to medium-high. Breaking up the butter can help it melt a little faster, so I do that if necessary. 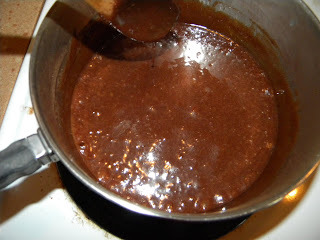 And then I stir continuously until the fudge comes to a full boil. The picture above shows what to look for. There are bubbles starting to form around the edges of the pan, but it's not quite ready to boil. Thing is, you don't want to wait too long to start the timer (or check your watch) once you reach a full boil because it only boils for one minute before taking off the heat. This is the sort of thing you look for -- large bubbles in the center of the pot that don't go away when you stir. 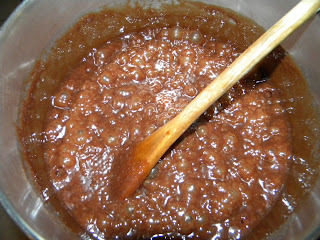 Let the fudge cook for one minute while stirring continuously. At the end of the minute of cooking, everything will be bubbling furiously. Take it off the heat. 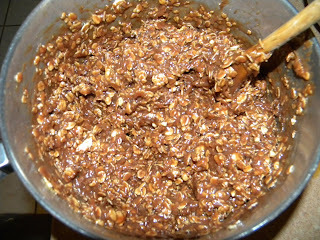 Stir everything in very thoroughly -- you especially want to make sure that there are no lumps of peanut butter. 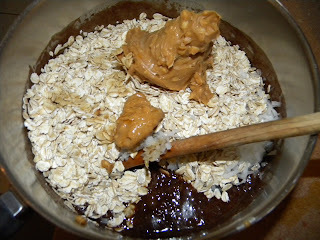 All that is left is to drop the oatmeal fudge mixture onto the waxed paper. 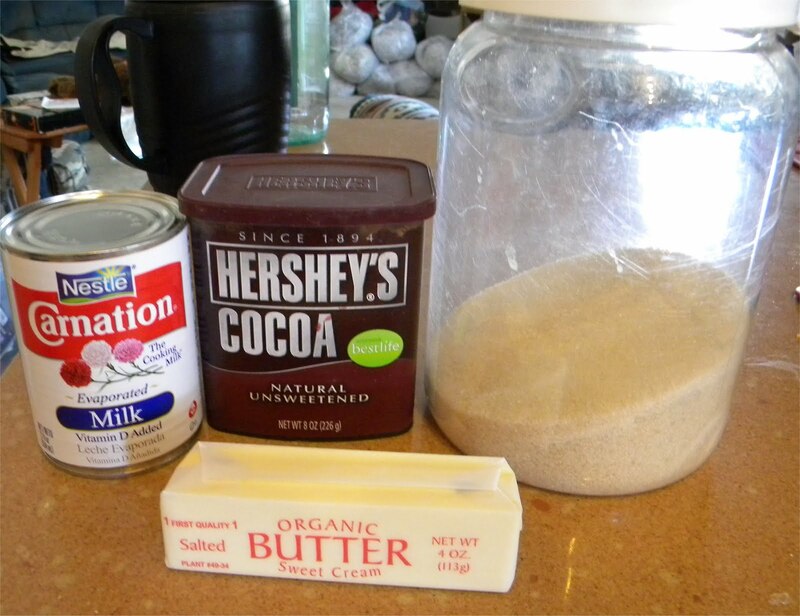 I do it the same way I make drop cookies -- take up a spoonful of stuff in a teaspoon, and use a second teaspoon to transfer the mixture from the first spoon to the waxed paper. 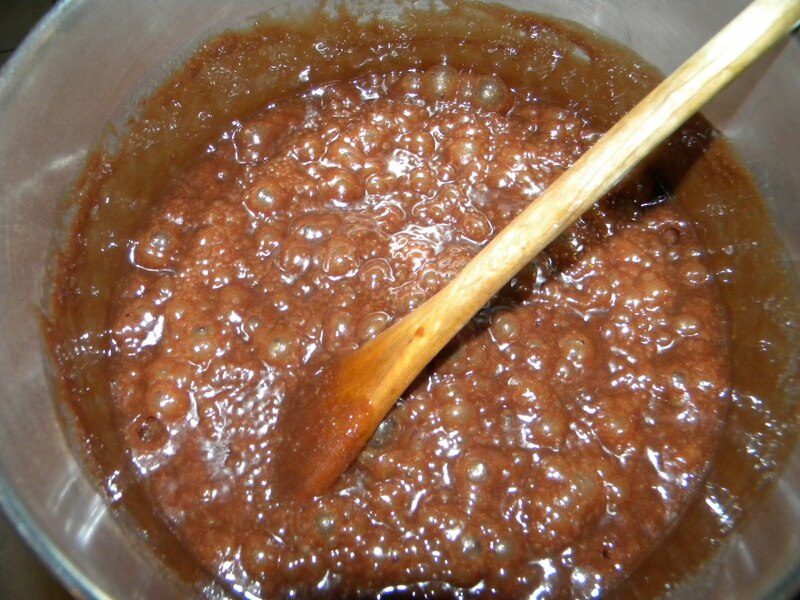 Work fast, because the fudge mixture will start to harden if it sits too long. Cookies are achieved! You can wait for the fudge to cool and harden a bit, or eat it right off the waxed paper. The "crumbs" are good, too. 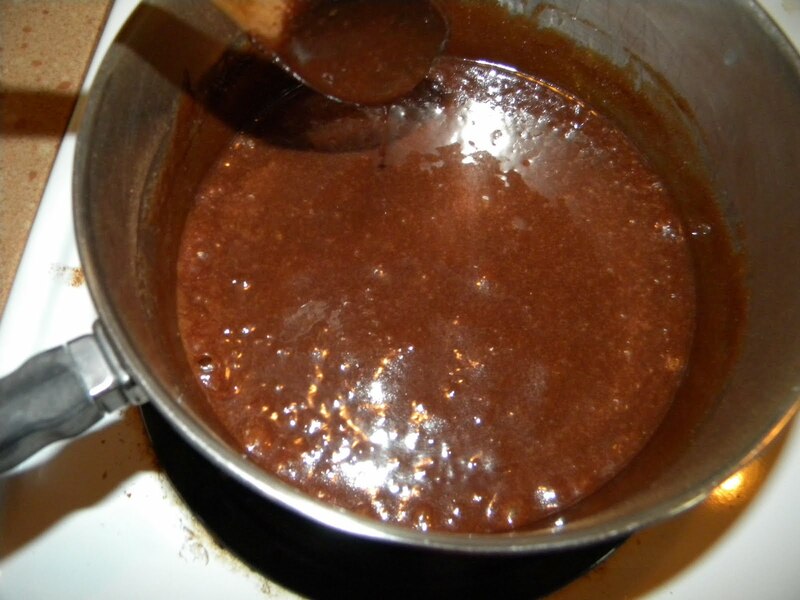 Mix sugar, butter, milk, and cocoa in a deep saucepan. Bring to a rapid boil. Cook for 1 minute, stirring continuously. Drop by spoonfuls onto waxed paper and let cool. Substitute wheat germ and/or bran flakes for some of the oatmeal. 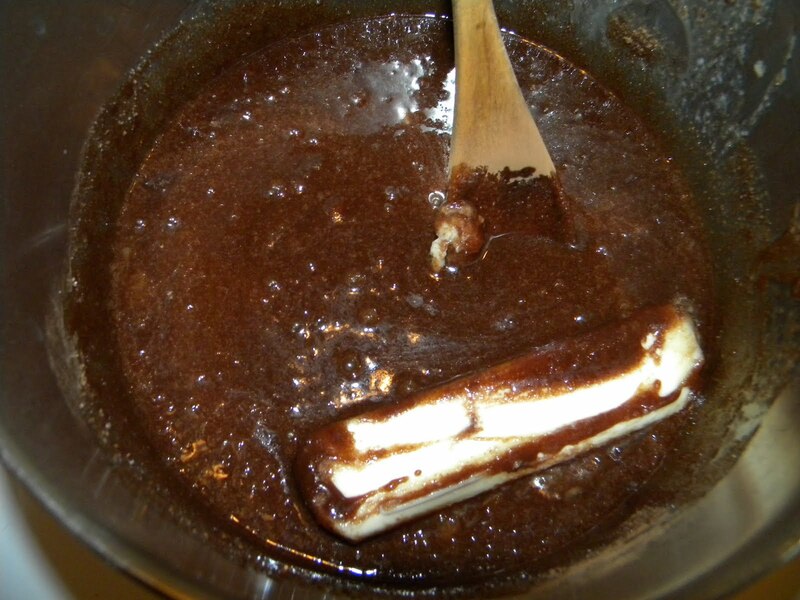 One time I either cooked the fudge too long or started the timer too late and the fudge got hard too quickly. 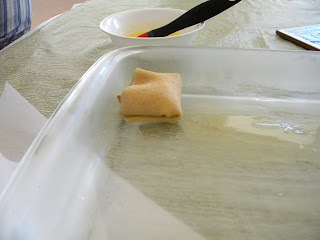 I couldn't really drop spoonfuls onto the waxed paper, so I formed spoonfuls into balls by rolling them in my palms. Worked okay; tasted good. What's really weird: I thought I had posted this last week, the week for entrees, only to discover tonight that I posted it to the wrong blog. So I'm posting this in here tonight and because it's almost tomorrow anyway, tomorrow I will post the dessert/sweet thing recipe I had in mind to post tonight. 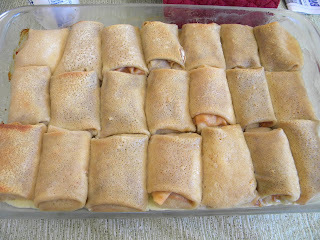 Shavuot is coming up in less than two weeks and for us, Shavuot means blintzes. 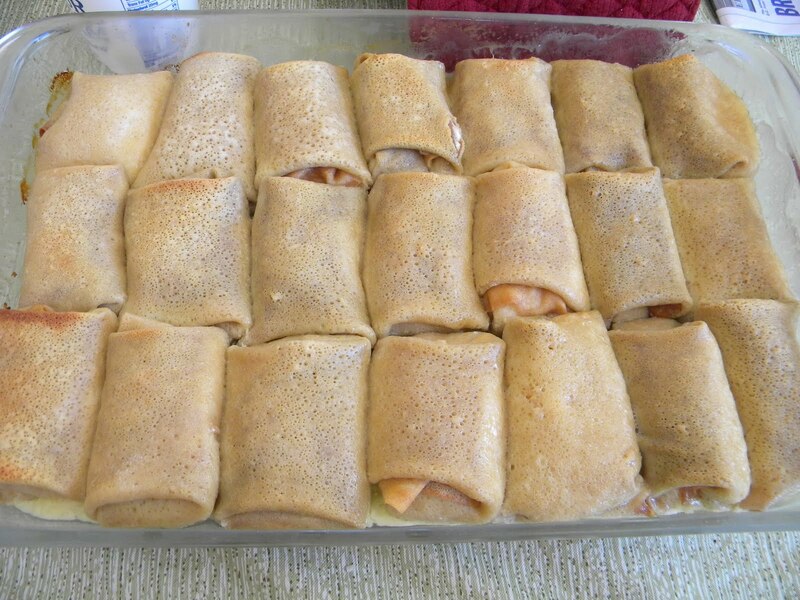 Like so many traditional Jewish foods, blintzes are one of the things that I never ate while I was growing up. They just weren't something that my mother made or bought or that we were likely to have anywhere we went. 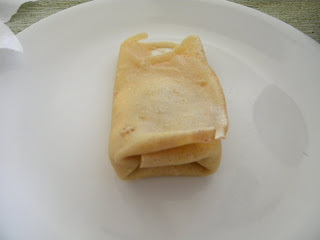 So when I first decided to make blintzes, I had no clue how to make them or even what they looked like. I read a lot of recipes and I found one that seemed do-able and tried it out. Thirty years or so (and some trial and error) later, I am still making blintzes. And tonight, I'm going to show you how I do it. Blintzes are but one of many things made using the same basic ingredients -- liquid (milk in this case), eggs, flour, fat (oil), and sugar. And maybe a little salt. The lumpiness really isn't a problem. It all works out in the end. I suppose this part could be done with a mixer, but since the lumps don't really matter, I don't see the advantage. 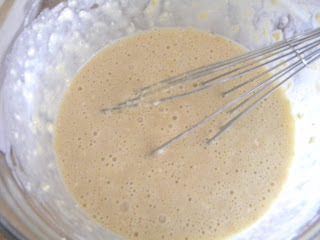 I just let the batter sit for a bit before starting to cook the pancakes, and whisk the batter every so often and the lumps pretty much go away. The pancakes cook pretty quickly, so I set up everything I need before I start to cook them. 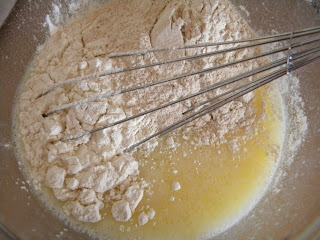 I usually make the batter in a bowl that has a spout for pouring. I keep it on a plate to minimize spills on the counter. 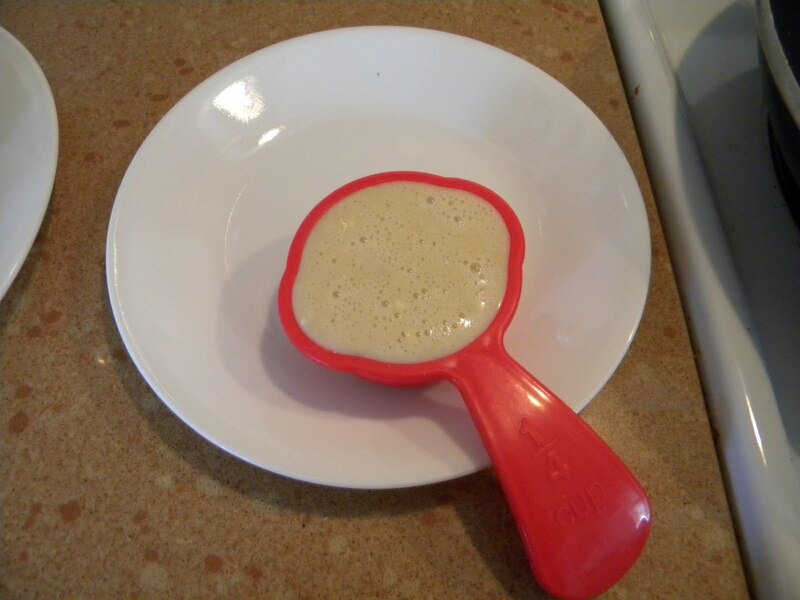 Since I use about 1/4 cup of batter per pancake, I get out that measuring cup and put it on its own plate. I also need a place for the cooked pancakes. For me, that's a dinner plate with a paper towel on the plate and another paper towel to put on top of the cooked blintz pancakes so that they don't dry out while making the rest of the batch. I use a nonstick T-fal-type pan with gently sloped sides for cooking blintzes. I spread just a little oil in the pan and get it really hot before starting to cook. That (above) was actually more oil than I needed. If there's too much oil in the pan, the first pancake is kind of oily-greasy and you may want to discard it (which is, I must admit, what happened to the first pancake I made while taking these pictures). 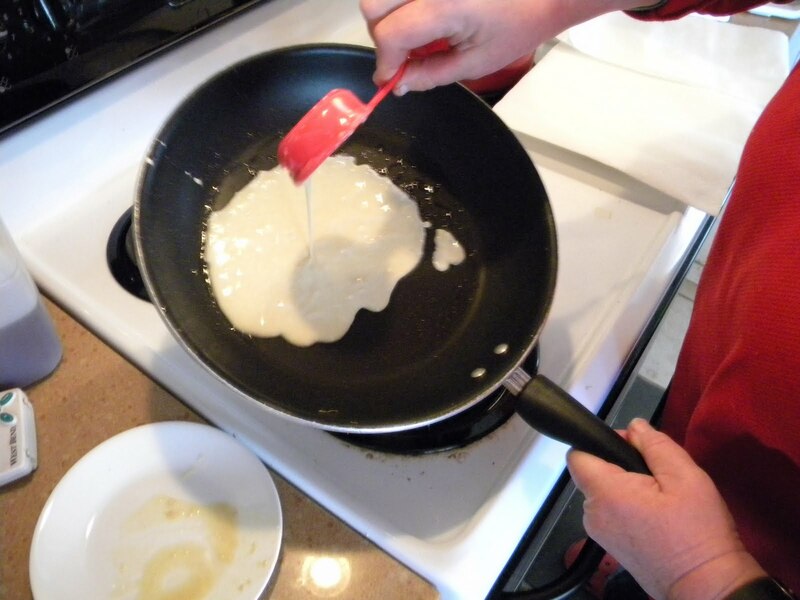 After the first pancake, there is no need to add more oil to the pan. 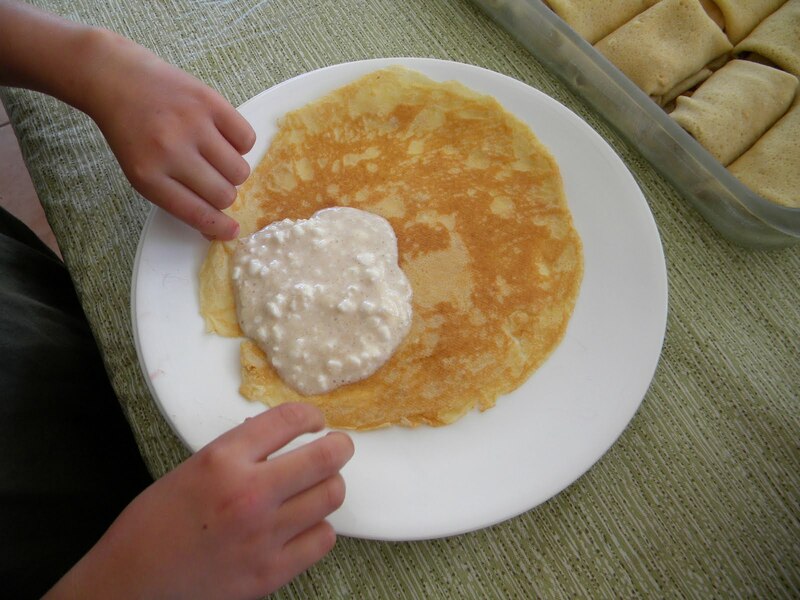 It's possible that you don't even need oil for the first pancake -- that's the kind of thing you can experiment with. 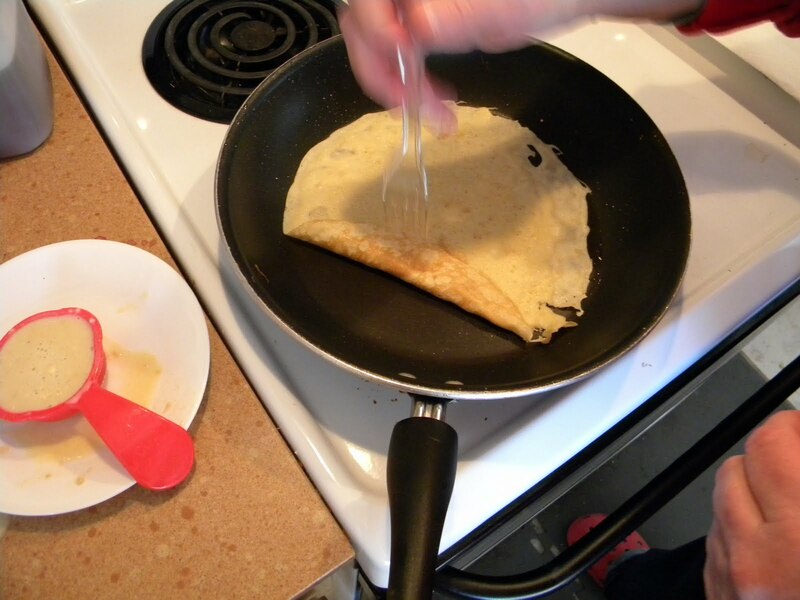 You may also need to experiment a bit with the temperature of the burner you are cooking the blintzes over. There's no hard-and-fast answer for what a "medium-high" heat is on your particular stove, but that's more or less what you want. Too high a heat and the blintzes will cook too fast, or even burn. Too low, and you'll have blintzes that are kind of pasty. 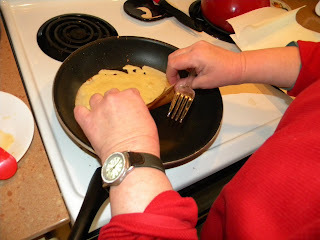 And pour it into the hot blintz pan, turning the pan to spread the batter out as much as possible all over the pan. As you can see, I lift the pan off the burner during this step and kind of rotate it around so that the blintz batter covers as much of the pan as possible. This isn't a process you can set a timer for and come back to. 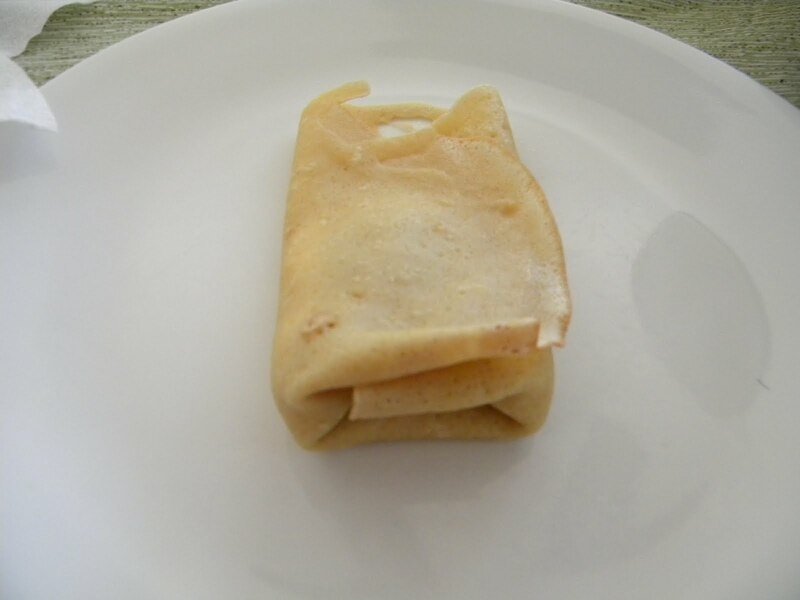 You have to stay with the blintzes until you are done. 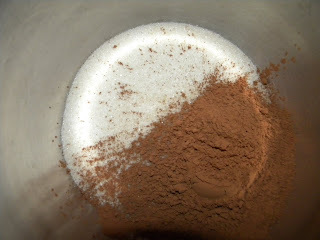 The first test for doneness is that the top becomes mostly dry. 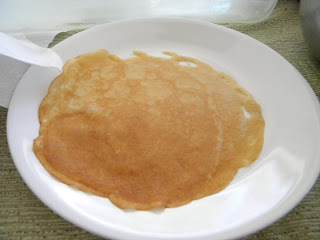 Sometimes, if the bottom is done but the top is still a little wet looking, I will quickly flip the pancake over. 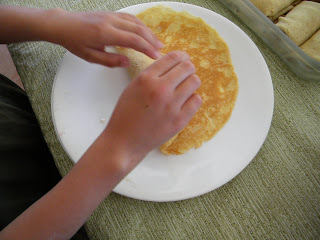 I just grab the edge of the pancake and flip it, then immediately pick it up and move it to the plate for finished pancakes. 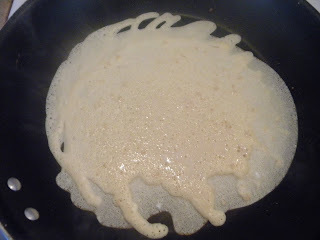 I don't let go of the pancake edge during this process -- it really is just a matter of letting the top side touch the hot pan and immediately removing it again. 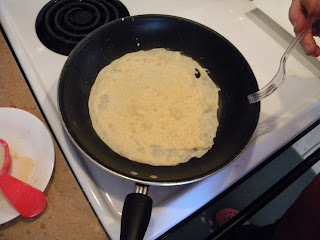 Each subsequent pancake is placed right on top of the previous one -- the cooked sides are always down and they really don't stick to each other. 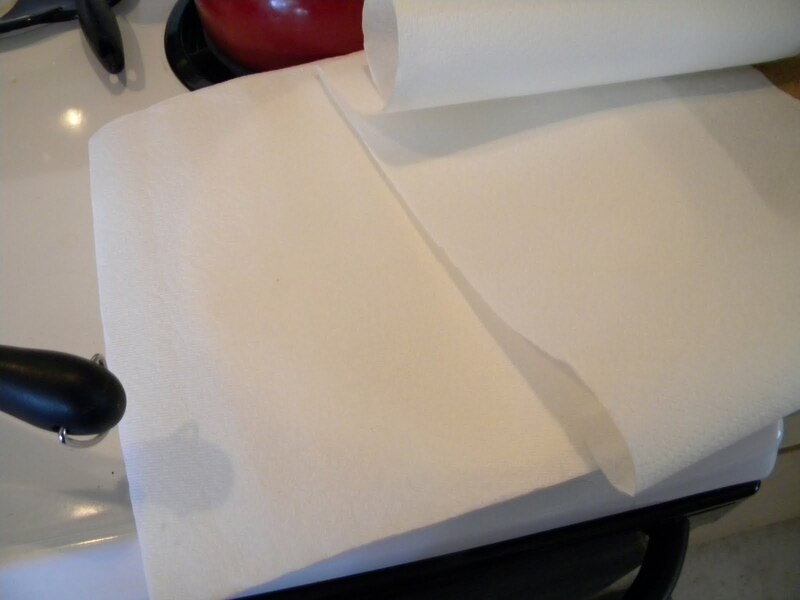 Always cover the pile up again so that they won't dry out while the rest of the batch is cooking. 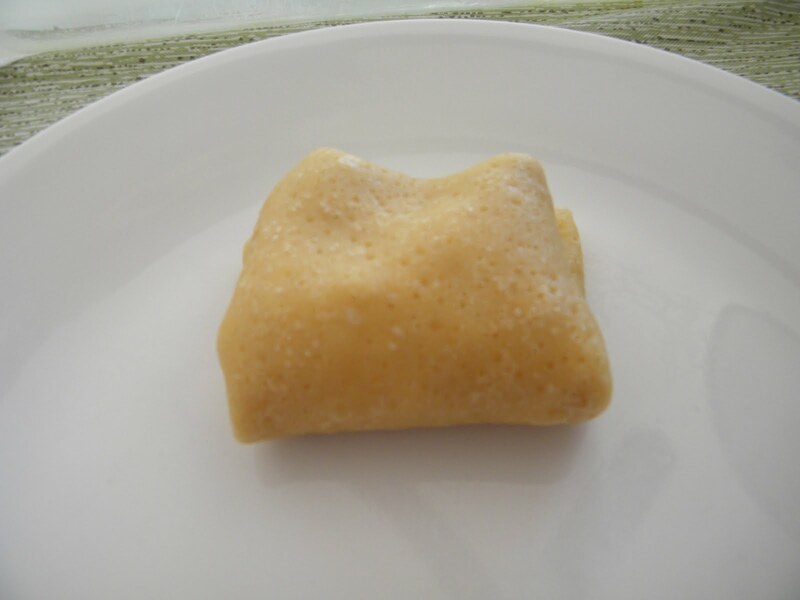 Oh ... sometimes you get kind of funny-shaped blintz pancakes. There's nothing wrong with these pancakes. 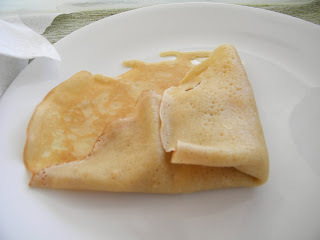 The blintzes made from them taste just as good. 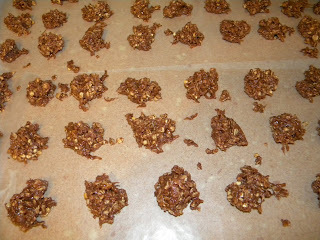 One more thing -- the pile above is the result of about 4 batches of batter. 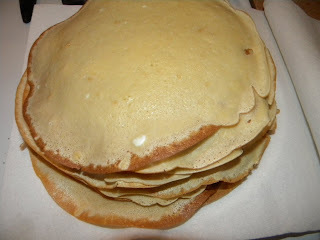 Each batch makes about 12 to 14 blintz pancakes. 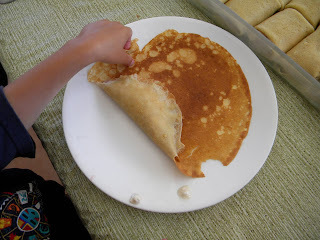 I usually have a helper mixing up the next batch of batter while I am cooking the pancakes because when I make blintzes for my family, 12 to 14 blintzes just isn't enough. Leave the covered stack of blintz pancakes alone for a bit and make some fillings. We almost always make strawberry, blueberry, and cheese blintzes. 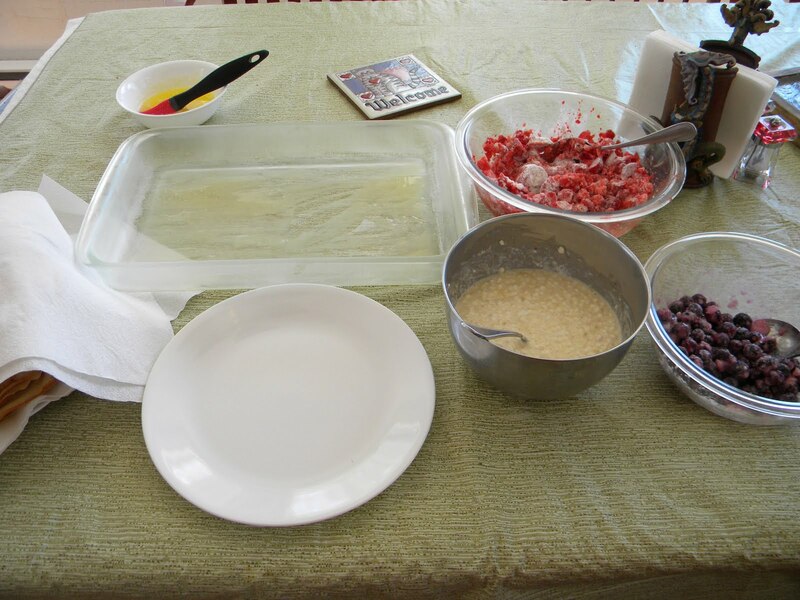 The fruit fillings are simple -- just mix the fruit with appropriate amounts of sugar and corn starch. Both are sort of discretionary amounts; i.e., I don't measure. If the fruit is really sweet, I use less sugar. 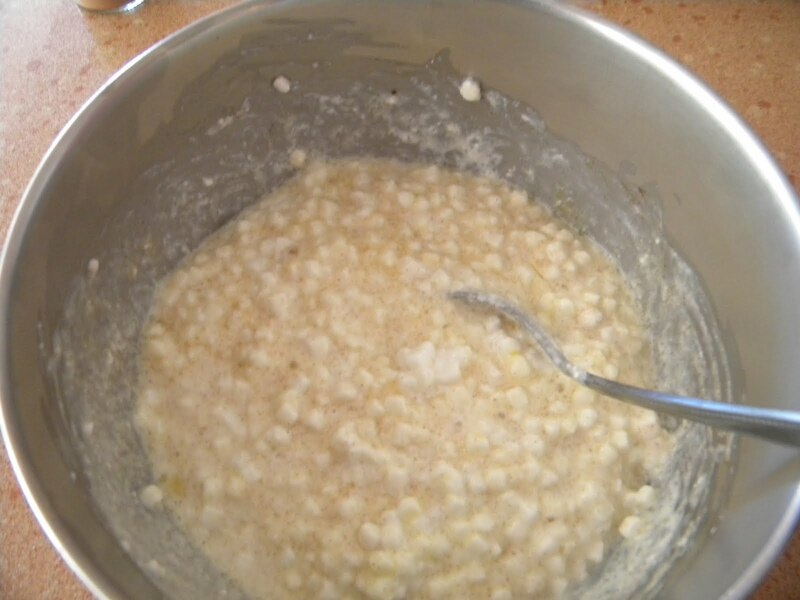 The corn starch is primarily for making a kind of sauce while the blintzes cook, and the amount varies according to how the cook feels on any particular day. 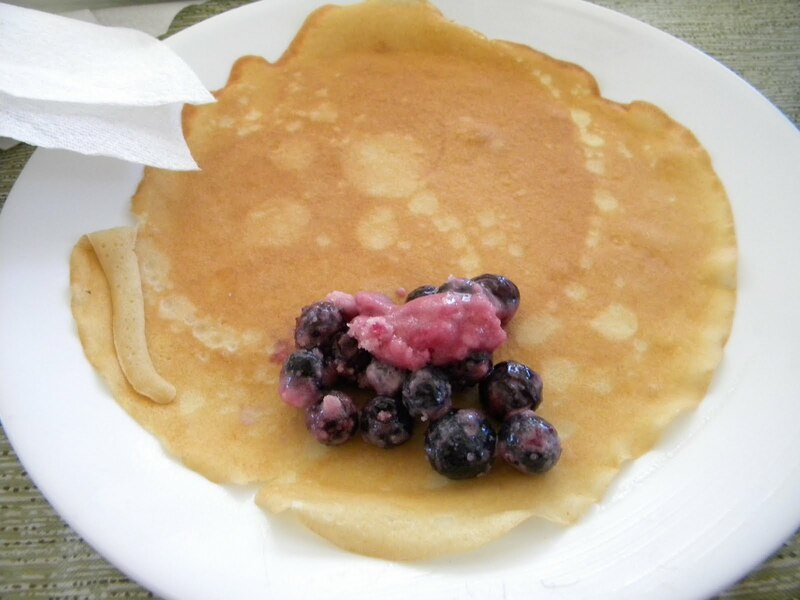 Fresh and frozen fruit both work very well in blintzes. The fillings above were made with frozen fruit. I buzzed the frozen strawberries in the food processor a bit so that the pieces would be smaller and easier to manage while filling blintzes. 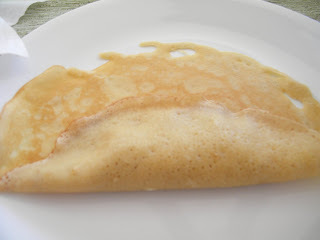 The classic cheese filling for blintzes is farmer's cheese, but since I had never heard of farmer's cheese the first time I made blintzes, I have always just used cottage cheese. 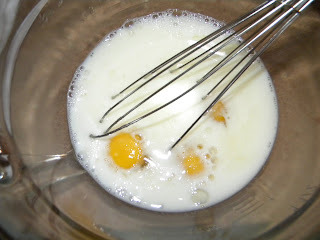 I add a little sugar, a little egg, maybe some lemon peel, always some cinnamon (I do have a recipe, but I kind of go with what's around). 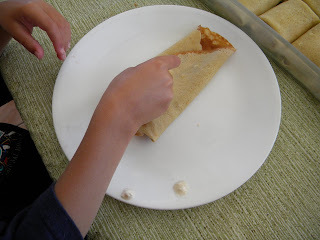 Now that the pancakes are cooked and the fillings are prepared, it's time to set up to put the blintzes together. 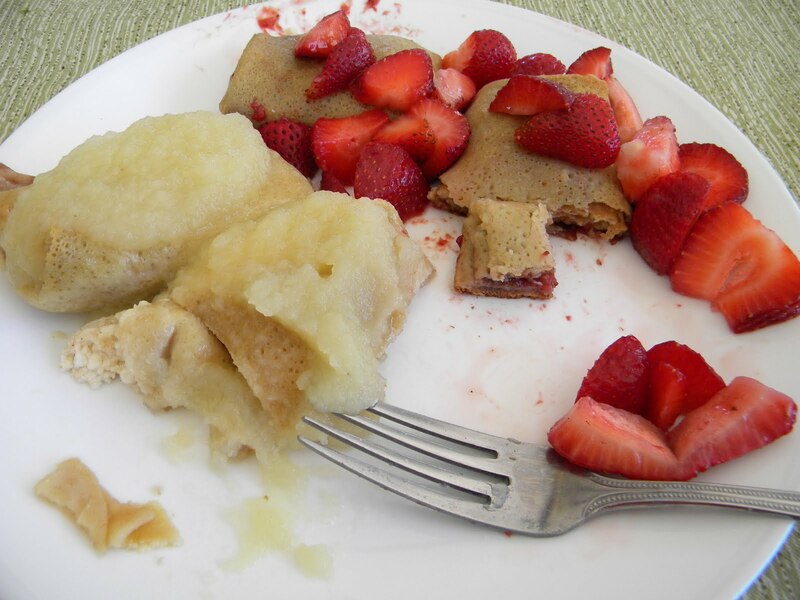 In the picture above, the plate of blintz pancakes (still covered) is on the left and the fillings are on the right. A clean plate for assembling blintzes is centrally located, and a pan spread with melted butter is waiting for the blintzes. 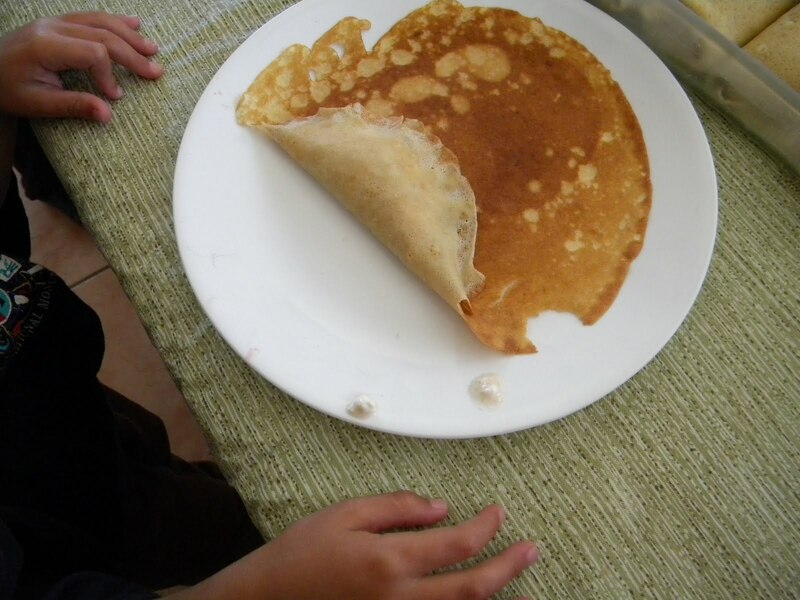 First, take a blintz pancake from the pile (and re-cover the pile) and place it on the plate, cooked side up. 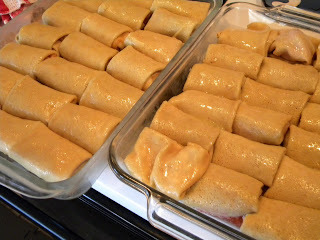 The cooked side will be on the inside of the blintz because the outside will get cooked in the oven. 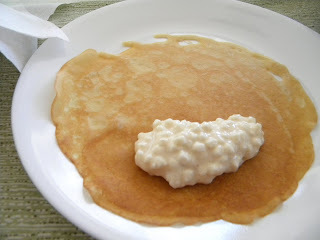 Next, put a spoonful of filling on the bottom part of the blintz pancake. Before putting the blintzes in the oven, brush the tops with more melted butter. And finally, the most important thing. Enjoy! Toppings are optional but tasty. Sour cream is traditional, but applesauce and fresh fruit, as shown here, are also really good. 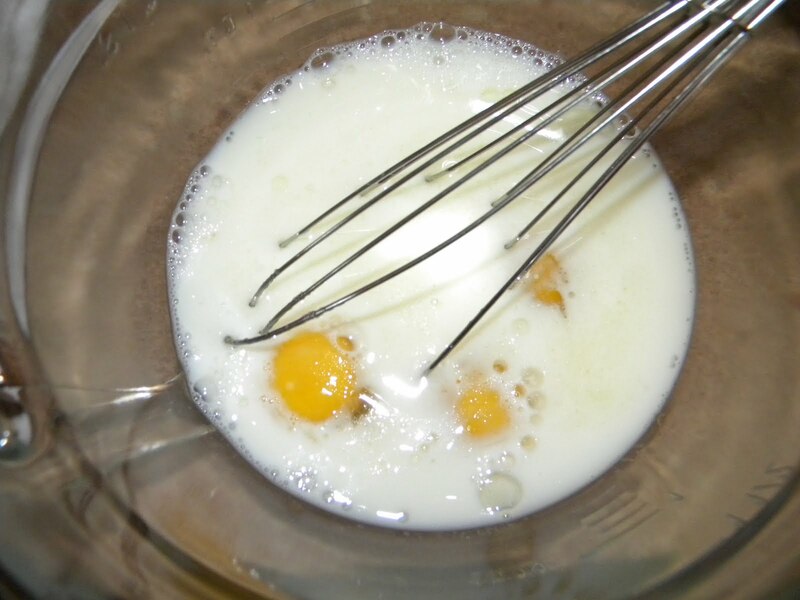 Mix the eggs, oil, and milk in a large bowl. Whisk in the flour, sugar, and salt. When the pan is really hot, pour in about 1/4 cup batter and tilt the pan to cover the bottom with the batter. Cook briefly, until the bottom of the pancake is lightly browned. 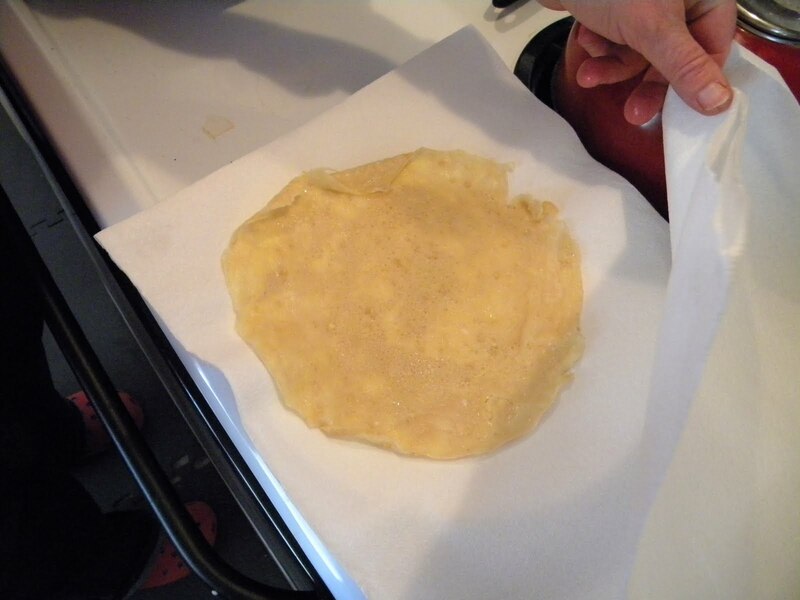 Lift the pancake out of the pan carefully and place on a paper towel. Repeat process until all the batter has been used. 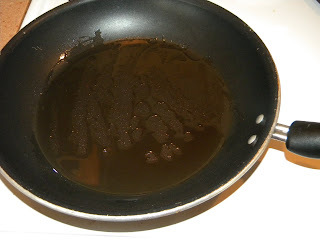 It probably won't be necessary to re-oil the pan after each pancake. See the note below about low-fat blintzes. Pancakes can be stacked, but keep pile covered with another paper towel. LOW FAT BLINTZES: To cut down on the fat in this recipe, use skim milk and egg substitutes instead of whole eggs. With a non-stick frying pan, little to no oil should be necessary. I usually brush the pan once at the beginning (pastry brush dipped in canola oil) and often don't have to do it again. 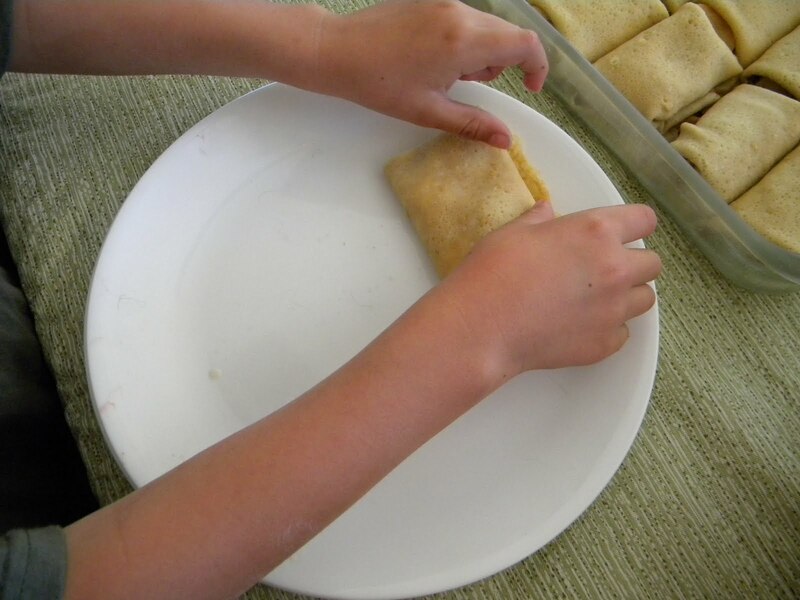 But it takes practice - beginners may need to oil the pan more frequently. Cooking sprays also work to help keep the pancakes from sticking to the pan. Fills 12-16 pancakes, depending on how generous you are with the filling. 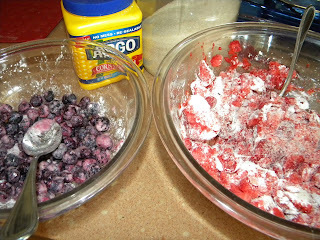 The sugar gives it a little sweetness, the cornstarch makes a nice blueberry syrup. Proportions aren't enormously important. 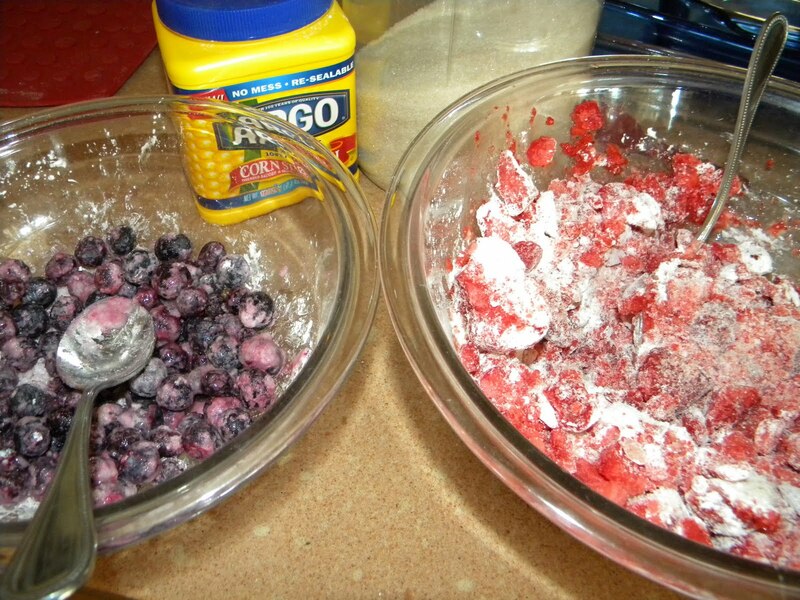 Mix the corn starch and sugar and toss the blueberries in the dry mixture. If you like kind of soupy blueberry mush, use more of the dry mixture. About the same as the blueberry mix, except use strawberries. Sliced strawberries are better than whole strawberries for this use. If you are using fresh strawberries, be sure to save some to spoon over the top after cooking. These are so good, I thought this picture bore repeating one more time.